All these years...who knew that Maybelline made great eye shadow! Wow! Actually, from what I have read, Maybelline reformulated their eye shadows about a year (or so) ago. The "newer" formulations are apparently much higher quality and better pigmentation. I honestly had never tried Maybelline shadows in the past, so I cant really compare. 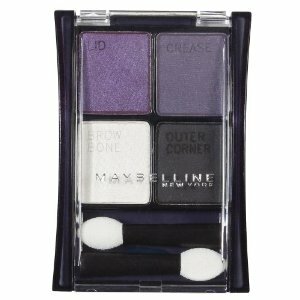 But, if you have tried Maybelline shadows in the past, and were not pleased, then now is the time to try their new formulations. And, the great news is that these shadows always seem to be on sale somewhere! I found mine all for less than $4.00 each with coupons and store discounts. That's less than $1 for each shadow in a quad! Can't beat that!!! I seem to really be looking more and more towards drugstore makeup lately. I used to be all about the High End lines like MAC, Stila, NARS, etc...and, don't get me wrong, I still *totally love and adore* those brands, but, hey...I am on a budget and just can't always afford those brands. They are expensive! Drugstore makeup is especially great when I want to try out a "new" or bold color or makeup trend. Plus, keep an eye out for coupons and combine them with in store sales, and you can get these drugstore items for insanely inexpensive prices. I seem to save "High End" purchases for special occasions now or very unique items or collectors products (like special edition palettes) or sets that are a good value...and face makeup (why stray from what I know works for foundation/powder/concealer). 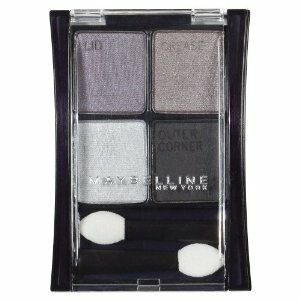 What really caught my eye, and got me into trying Maybelline shadows was seeing their "Stylish Smokes" series. What a great idea to have every shade that you need for a quick/basic smokey eye in one little palette!!! I have not tried all of them. But, I will review what I have tried. I have the "Natural Smokes", "Amethyst Smokes", and "Charcoal Smokes" quads. I believe the only one that I haven't tried that is currently available is the "Emerald Smokes". 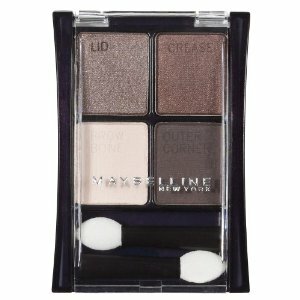 The quads are labeled with "lid", "crease", "brow bone", and "outer corner" stamped into the shadows for fool-proof application of a smokey eye. There is also a little diagram on the back to help you beginners. Great kits for makeup beginners! Now you can apply however you like, but I usually follow their recommendations. So easy! I don't use the sponge applicators (as usual) that come with the set. I apply with my own makeup brushes. This is the stand out quad in this line. My fav of the three. For me it creates a beautiful and easy smokey eye that is daytime wearable. Absolutely beautiful! I love it that it contains both matte and shimmer shades. They all blend beautifully and work very well together! My go-to shadows for a brown smokey eye! This is a great quad for a dark smokey eye. On me, this wears best as an evening/going out smokey eye. Overall, the shadows are pigmented, especially the crease shade. I do wish that the black was more pigmented. Once you blend the black, it isn't as dark as I would like. But, overall, I like this quad. This quad is worth it for the beautiful duo chrome purple lid shade alone. This is such a complex color! It is a purple with a blue sheen. Totally beautiful! This kit creates a dramatic eye that is great for evening wear/going out. Can get quite a bold look with this quad. Tip: "Foil"(Foil=apply wet) the purple...it makes it more vivid. Hope you enjoyed reading. And, I would love to hear what Maybelline shadows you guys like! If you try the Emerald one...let me know!!! Thanks for the follow! Just subscribe,i must say i love your Blog! I think they are good product,perfect for travelling,but here in Italy they are NEVER ON SALE,and cost from 8 to 10 euros! That's why i prefer buying other Brand with better quality. Wow, they are pricey in Italy! Thanks for the kind words and for subscribing!